When I was eighteen, I read Margaret Atwood’s The Handmaid’s Tale, and it blew the bloody doors off my intellectual and emotional prison and opened up a whole new world of feminist consciousness. It changed my life. Only Ever Yours is the only book since that has repeated that moment in time in my personal history – and I think every young woman should read it. It’s searing, brutal and undeniably honest, and whilst set in a future dystopia, just like Atwood’s novel it’s so woven from real events and behaviours it lays all society’s current failings bare for all to see. frieda is sixteen, and has spent her entire life in the School, run by the chastities. All the girls are obsessed by their appearance – but in this future, the School enforces that obsession, by daily weigh-ins, a ranking system and lessons where the girls’ bodies are ruthlessly compared to those of their peers. Brainwashed since birth, the girls face a future either as companions – wives to rich men – or concubines. As the day of the Ceremony inexorably draws near, the day when their future role will be assigned to them, their competitiveness reaches fever pitch. But frieda is slowly failing, knocked out of orbit as one of the most highly ranked girls, by her former best friend isabel. Formerly #1, or queen bee, isabel seems to be on self-destruct, and as frieda tries to both help isabel and simultaneously distance herself from her, she’s making mistakes and getting noticed in the wrong ways. The consequences will be shattering. This novel is brutal from the first page, and while the true horrors of their adult lives are only suggested, never fully revealed, O’Neill creates a very visceral sense of a claustrophobic community where there is truly no way out. Chickens get a taste of your meat girl… Atwood’s heroines were often passively complicit in their oppression, and in O’Neill’s novel, the ways in which women betray each other on a daily basis, thus enabling the power of the patriarchy to be maintained, are searingly dissected. frieda is not your average heroine either, not always sympathetic, not always likeable. And where other novels may have taken the romantic option (i.e. your knight in shining armour will rescue you), O’Neill plays it true to the end, in a truly haunting, terrible climax. There is so much texture to this book, so much to devour and debate, so many clever allusions, all within a compelling plot populated by vivid characters. It’s one of the most challenging Young Adult books I’ve read and certainly has the power to awaken feminist consciousness in teenage girls (and women), changing lives in the process. I actually think it’s better than The Handmaid’s Tale – more cutting, more graphic, and more unflinching in it’s exposure of female relationships. Terrifying and compulsive, Only Ever Yours takes it’s place on my shelf of books that change your life. Superb. 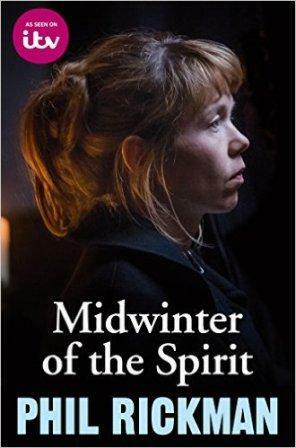 Midwinter of the Spirit, adapted from Phil Rickman’s wonderful novel, starts next Wednesday, 9pm on ITV. I shall be glued to the screen!! If you’ve been moved by the plight of the refugees over the past few weeks and months, please consider donating to this Save the Children appeal. It was started by the awesome children’s author Patrick Ness and has garnered over half a million pounds already – it would be great to get it to a million! Authors and publishers are giving very generously, often £10,000 a piece as the total hits each target. It’s a phenomenal effort and just shows that compassion and generosity are still alive and kicking in these troubled times. NEWSFLASH: Churches and football stadiums to be closed due to falling visitor numbers! Imagine if that was the headline… imagine the OUTRAGE! The arguments! The protests! What’s the most popular activity in the UK? This was a little outside my comfort zone initially, as I’m not a reader of slash fiction on the internet, but this doesn’t really matter. At its heart it is a serial killer whodunnit, and although it is not for the easily offended, it is great fun. The characters are writ large, but are entertaining for that; if the cops are rather unbelievable, as a TV in-joke they work perfectly. Alex’s snooping reveals the bitter, greedy and fake side of the celebrity industry, just as it reveals that she, a clever woman, cannot read people at all. She’s an interesting heroine – brave, reckless, and often clueless – as her own issues cloud her perception. I loved the coarse banter between her and Perry, as their animosity grows into something more meaningful. Raw and cutting, it’s a relationship fresh out of a Chuck Palahniuk novel. The most enjoyable aspect of the novel is as metafiction – it’s fiction about fiction about fiction – constructing layers of fictional reality which shows the reader the lies that each is built on. It’s an interesting concept. At first I was a little disorientated, as Alex’s private world and the internet slash fiction mesh with each other, but quickly realised that that’s the point – in a world where we are surrounded and saturated with stories, who’s to say which one is more real than the other? Definitely a whodunnit for the internet age, this was originally written as a series on the author’s blog, but is now available as a collected edition. For more information see Evan’s website, and you can download Slash to Kindle via Amazon. With thanks to Evan for the review copy.